Inspired by the possibilities that my teff-flour pancake last night laid before me, I cranked out a batch of Everything muffins this afternoon--everything but the wheat gluten, anyway. 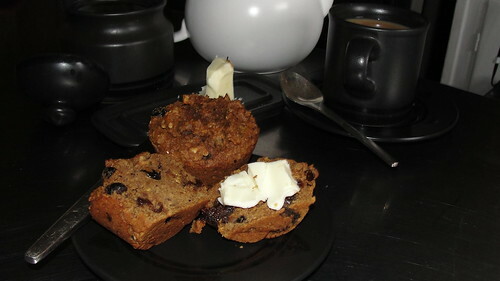 My original recipe calls for whole wheat flour and wheat bran--I subbed teff flour and oat bran--and makes a dozen rather heavy, hearty, filling breakfast muffins. Preheat oven to 425. Prepare pans for a dozen standard-size muffins. If you're using dried berries or other fruits, put them about 1/3 cup of them in a pan with some water and simmer them to rehydrate and plump them up. Stir in the milk-and-bran mixture. Lightly stir in the flour mixture. Spoon mixture into prepared muffin pan(s). Bake at 425 for 20-25 minutes. The teff flour makes them a little more fragile and crumbly than they'd be with wheat flour--I think I might add a bit of xanthan gum to the flour mixture next time--but it has a delicious flavor and a wonderful dark color. Yum. You could throw just about anything into these muffins, and as long as the batter holds the chunky ingredients together, they will be delicious. I hate to tell you how good they are with some butter on 'em, but they really are. Those sound (and look) delicious. Will try! Oh cool! Bear in mind that this is a non-professional recipe from a rather vague and hand-wavy baker. Adjust things as you think is needed and trust your instincts more than my recipe! 450 degree oven, cooked in a 10-inch cast iron skillet (melt the butter in the oven then pour in the batter; bake for about 35 mins). If Miss Lewis says that cornbread does not have flour in it, she should know! That sounds delicious. I saw a GF recipe the other day that called for masa harina, and I realised that of course, corn meal, flour, and starch are all perfectly good GF options. I've never made cornbread with no wheat flour, though. Must be almost a custardy effect, with all those eggs and all that buttermilk. It really sounds wonderful. damn that looks delicious! i'm saving this recipe so i can try it soon! I'm having one now with my coffee. Yummy and filling. And lots of good healthsome fiber. Delicious! I am somewhat late to join the party. I would absolutely love to find a portrait of your very esteemable self, madam. Since posting that recipe I've learned a bit more about GF baking, and I believe that two things will make them better: a bit more liquid and letting the batter sit and rest for an hour before putting the muffins in the oven. As to a portrait, hah! I'm over 50. I can't stand seeing pictures of myself, so there really aren't any. Have a super-flattering cartoon instead. You don't scare me, ES. I'm 47. Your cartoon looks rockin.' Here's mine. Always nice to meet (almost) a fellow baby-boomer here in these Gen-X precincts!